Hughey Phillips, LLP | Hughey Law Group is thrilled to represent Creator X, and we look forward to rapid expansion of its arts education and training programs. 16 Jul Hughey Law Group is thrilled to represent Creator X, and we look forward to rapid expansion of its arts education and training programs. 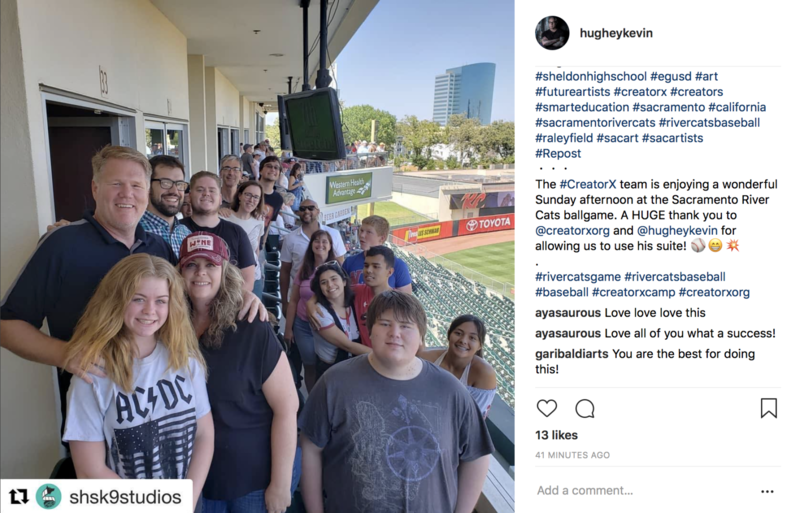 The #CreatorX team is enjoying a wonderful Sunday afternoon at the Sacramento River Cats ballgame. A HUGE thank you to @creatorxorg and @hugheykevin for allowing us to use his suite! ⚾️?? Incredible, talented group of youths who are extremely fortunate to work with amazingly skilled, creative and generous Creator X founders and leadership comprised of Shawn Sullivan of K9 Studios and Elk Grove USD, Rebecca Bush, and David Garibaldi of Garibaldi Arts, and the tireless executive effort from Ashley Benavente of Garibaldi Arts, as well as many others. The Creator X team of leadership and student mentors devised and delivered a truly extraordinary, one-of-kind arts exposure, education and training program for high school kids in connection with the program’s first-ever debut in July 12-13, 2018. Big time congratulations!